My time in Ghana was simply unforgettable and I would one hundred and ten percent recommend it! I am seventeen and my plan is to study Medicine so I thought this would be the perfect opportunity to enhance my application and also have an adventurous summer. I was very nervous on the plane because I had never travelled outside of Europe before and I had never been away on my own, however I was full of excitement and I think my parents were more worried than me. I had managed to get in contact with other people who I would be staying with so this made me feel more at ease. I arrived in Accra (the capital of Ghana) late at night and Charles met me and took me to the Pink Hostel. I was very nervous and it was a huge culture shock to see the hustling city but when I arrived at the hostel I met a Swiss girl who was really friendly. The next day I travelled to Mole National Park and met the other volunteers there. It was here I was able to see elephants and baboons for the first time. This was extraordinary and the elephants were much bigger than I expected, even the baby ones. 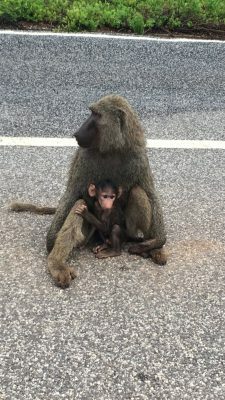 The baboons were very cheeky and the following morning we were awoken to a baboon that had entered our room and was searching through our bags to find food. At the time it was rather scary but it was also extremely funny! The food at Mole was also great and there was a swimming pool; I would recommend going if you have the time. 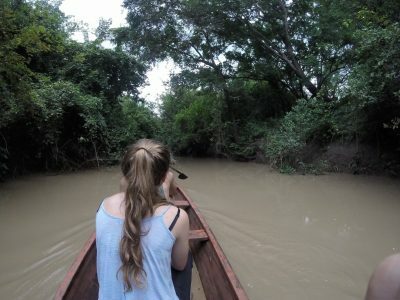 We also visited a local village where we went on a river safari in canoes. I was amazed to see how people live their life and it was exactly like what you see on TV. The final night we moved to Larabanga and stayed at a hostel. This made me feel like a ‘real’ traveller because the conditions were very basic but it was definitely an experience. We then had to travel to Cape Coast, where I would be staying for the next two weeks. I nearly didn’t get a flight back to Accra, but after some persuasion and a little bit of bribery I managed to make it back. After a fun filled weekend my placement at Cape Coast teaching hospital started on Monday. I was shown around the local town and the hospital where I was able to choose between a variety of departments to spend my time in. I spent the majority of my time in the emergency department and a day in the delivery suite. This was very flexible which was great! Likewise, the time you spent at the hospital was flexible but I mostly started at 8 and finished at 2. The transport to and from the hospital was easy and consisted of two taxis taking about 10 minutes. I learnt a lot in the hospital and I witnessed and helped with things I would never have imagined. I was able to take vitals, help with taking blood, apply wound dressings and see minor surgeries. I also witnessed two cardiac arrests, where the patients survived and two deaths. This was a lot to take in but it helped being able to discuss what I saw with other future medics back at the house in the evening. It also reinforced my choice for wanting to become a doctor and demonstrated that I have the ability to overcome stressful situations. I learnt how the health service in Ghana differs from that in the UK and it made me appreciate the NHS a lot more. I think the most amazing thing I saw was a tiny, little baby crawling out of its mother’s womb and being brought into the world. The doctors and nurses were very good at explaining procedures and were all very friendly – I think that is the Ghanaian way. 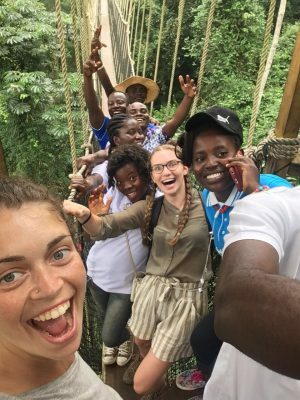 The following weekend I went to Cape Coast Castle and Kakum national park with a couple of American medical students and another volunteer I had met. This was yet another amazing experience and I loved being in the canopies above the trees in Kakum. The views were stunning and the locals were very friendly and enjoyed taking photos with us. Both these attractions were fairly close to where we stayed and are both worthwhile visiting. On the Sunday, Mary (the woman who lives in the house we were staying), took three of us to church. This was inspiring and I was fascinated to see how different cultures embrace religion. We also visited Oasis, a bar/restaurant, where many tourists/volunteers go. The food there was very nice and the dancing was extremely fun. There was a mix of tourists and locals and the Ghanaian men enjoyed teaching me a few dance moves. I would strongly recommend going to Oasis on a Friday/Saturday night. During my last week in Ghana I started to enjoy my placement even more because I was becoming more familiar with the way the hospital worked and I got to know the staff. In the evenings we played football and basketball with the local children because the boy, who lived opposite, was very keen for us to meet all his friends. I really enjoyed this and I could see that the children loved playing with us. It was a shame I had to leave the following week because I would have loved to play some more basketball with them. On Saturday morning I headed home despite wanting to stay, but I was very proud of what I had achieved. My time there has given me the confidence to want to pursue my dream of becoming a doctor, meanwhile making me more independent, thankful for the things I take for granted and giving me the buzz of wanted to travel more of the world. Overall, I would strongly recommend traveling with Global Medical Projects because there was a strong support system before arriving and while being in Ghana. I was also able to see and do a wide range of things in the hospital. All the staff were extremely friendly and helpful and Ghana as a place was full of culture and vibrancy. Great job Siobhan. 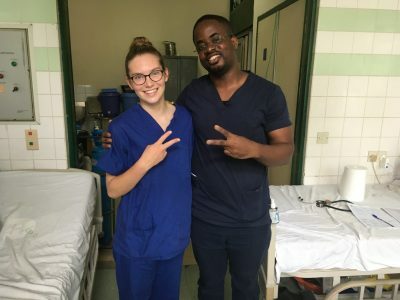 Follow in Siobhan’s footsteps and find out more about our Pre-university Medical Projects in Ghana! We hope to see you again for your medical elective or when you qualify as a doctor!